Derby County have signed Chelsea midfielder Mason Mount and Liverpool midfielder Harry Wilson on season-long loan deals. He played 38 times while on loan at Dutch side Vitesse Arnhem last season. 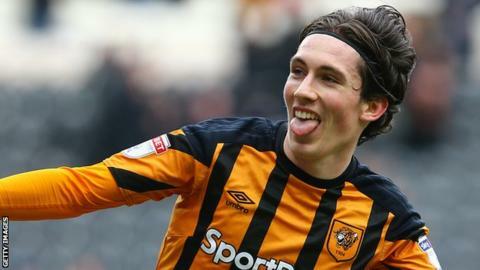 Wilson, 21, scored seven times in 13 games while on loan with Championship rivals Hull City during 2017-18. Mount, who has been part of Chelsea's academy since the age of six, is yet to make a first team appearance for the Premier League side. He scored 14 goals as Vitesse finished sixth in the Dutch top flight in 2017-18. Wilson is the youngest player to ever represent Wales, at 16 years and 208 days old, and went on to score his first international goal in their 6-0 win over China in March. "I'm delighted to get both of these deals done and add players of their quality and calibre to the squad," Rams manager Frank Lampard told the club's website. "I know Mason really well from my Chelsea links and I have also watched him play in their very successful youth teams. "Harry brings incredible quality and hunger to the table here and he showed that last year while he was on loan at Hull. He's a full international too and he has a real desire to come here and improve."